Few posts have garnered as many views, questions and comments in this blog as our posts on choosing the least toxic car seat. As parents, many of us are clearly frustrated that a product that so obviously needs to be used every single day and that keeps our children safe inside a car is also, at the same time, exposing them to some pretty bad toxic chemicals. There is just no reliable way of telling which seats have which chemicals, or how much of them. Even companies who claim to be using "safe flame retardants" (according to the study I will mention below) it turns out use potentially toxic chemicals in their car seats. Company websites and even customer service representatives are often times giving out incorrect information to concerned consumers. What is a concerned parent to do? We all have to use car seats. Period. They save lives. So the question really is: how do you choose the least toxic option? Today's reality is this: all car seats in the market right now in the US contain at least one chemical flame retardant in order to meet the federal fire test standard for vehicle accessories. With that in mind, today's post is intended to help consumers buy an essential child safety product among an imperfect field. This is also what the Ecology Center, a Michigan based nonprofit, had in mind when they recently published their newest findings on toxic chemicals in children's car seat (as a side note, do visit their website and perhaps support them since they are one of few organizations testing children's car seats today!). Fifteen (15) of the best selling 2014-model car seats were included and tested for various different flame retardants that have been linked to thyroid problems, learning and memory impairment, decreased fertility, behavioral changes and cancer. Chlorinated tris= proven to be carcinogenic = should never again be used in children's products right? Fast forward to 2004... In 2004 (after another flame retardant was phased out due to health concerns) Chlorinated tris once again became the go to chemical for a number of products; in furniture, car interiors, tents, and children’s products such as nap mats and crib pads (but not pajamas). Where else? Yes, you guessed it, this proven carcinogenic chemical was also found in two of the 2014 model car seats in this new study. This is a good example of how replacement chemicals are sometimes no safer than the banned chemicals they are replacing. Sometimes (as is the case with chlorinated tris) "proven" bad chemicals make a comeback, other times, new chemicals with little to no safety studies are used. This is why Federal Chemical Safety Laws need to be updated - but that is a whole other issue. Phosphate-based. These are the replacement chemicals du jour being used to replace the toxic halogenated flame retardants. According to limited research studies, some of these replacements may be safer for human health. Let's cross our fingers, because while laws continue to require flame retardants in car seats these seem to be our safest bet. Some manufacturers, such as Britax and Clek, are opting for these chemicals because so far they seem like the least toxic of the 3. Limit direct sunlight on the car seat and high temperatures in your car. Window coverings in a car also substantially lower the interior temperature on a warm day. Washing car seat covers can remove contaminated dust and other particles. In October 2016 we also informed our readers of the first reportedly flame retardant free infant car seat. Read our post ' COMING SOON- THE FIRST FLAME RETARDANT FREE INFANT CAR SEAT' to find out more! Thank you for this post. I have been searching for the least toxic yet safest car seat and it has been a struggle. I was between Britax, Graco, and Diono. It looks like Britax wins. Where did you find the rating for the Britax Clicktight? I didn't see it on heathystuff.org, just Marathon in general. Hi! Thanks so much for your comment- according to this latest study, indeed, it seems Britax is a safer bet. Thanks for calling our attention to the typo though! Indeed the study only looked at the Britax Marathon (Convertible). This has been corrected! Thank you!! I wish it worked like that, but unfortunately it doesn't. While it is true that flame retardant chemicals do not bind very well to the foam/fabric they are sprayed on (causing it to migrate into the dust and air you breathe at home and in the car), it is also true that SO MUCH flame retardant chemical is impregnated on the foam that it can stick around for many many years. According to the lead researcher from Duke University's Superfund research program on flame retardant, she found that "some retardants were used in sufficiently high quantities that even after more than two decades, the PentaBDE in one old couch accounted for approximately 4% by weight of foam samples taken from its cushions". In fact, I would even go as far as to tell you not to put these items in the sun since the sun could be deteriorating the fabric? 1. look into an organic car seat cover that fits snuggly on your car seat (I believe Etsy has some - if I come across it I will post it here). 2. minimize the time your infant is in that car seat. Lot's of moms (me included with my first baby) tend to let their babies nap in the infant seat when you are out and about and leave the baby in that infant seat by attaching it to the stroller. 4. Keep the interior of your car and house clean and as dust free as possible. Britax is the best brand of stroller and carseat, I've never have to worry about their quality. Any news on the Diono Rainier? How does it currently stand up to the others? I'm confused why no one is talking about the NUNA. WE HAVE 2 of these car seats and love them. They are the best built and least toxic car seats on the market. I only wish they would make another model for older children. Hi! I have heard good things about the NUNA however, the NUNA was not included in the recent testing and as such, as consumers, we have no reliable way to really know if they do or do not use flame retardants. In the past companies (like Orbit) who have claimed to not use flame retardants were shown to indeed have flame retardants. Because of this I can't officially recommend the NUNA even if they report not using flame retardants.... quite frankly I have lost some of my faith in many car seat companies...... Having said that I did send an email to the folks at the Ecology Center suggesting they consider testing the Nuna in their next group of tests. Hopefully they will! (ps I have heard that some mothers have independently had their NUNA's tested by Duke's Superfund and these have indeed come out negative for flame retardants. Unfortunatley Duke does not publish their results and brands tested - so there is no official record that I have seen. If you happen to have the opportunity to send in a foam sample to Duke ( http://foam.pratt.duke.edu/how-submit-sample ) and they send you an official record please please please share with me!!! The Clek has an infant insert that allows the car seat to be used, rear facing for infants 5 -22 lbs. I believe the Britax MArathon alsoo has an infant insert - but not 100% sure. Hi! Two sided answer: on one hand that particular model was not tested so we have no way of confirming if it does or does not contain the most worrisome flame retardant chemicals. However, the three Britax models that were tested tested well. The company has made a pledge to phase out the worse types of flame retardant chemicals (which normally would not mean anything since many of these companies have unfortunately proven to be deceptive, but considering that three of their models are in line with what the company is saying it *seems* to be true...). if the three models included are absolutely out of your price range I would venture to conclude that their other (new model) car seats should be ok too..... but, like I said, unless someone tests it there is no assurance . it looks like the tested britax Marathon carseat came in Wave upholstery. That looks to be generally sold out, but if I remember results from older tests I have read, It seems like the results for car seats of the same make/model vary widely depending on which color/upholstery is chosen. If I can't find a Wave, is there any reason to think the results for the Britax Marathon will apply across the other upholstery styles in the Marathon line? Not sure why they were not included - I have contacted them and made suggestions for future testing- but since they are a non profit they have to get funding which is not always easy. Hopefully they will able to do a new updated study soon though! Many new car seats brands and models to test ! Sorry for the late response - somehow I missed your message in November! 1. Different colors and materials from the same company have indeed tested differently in the past..... since we ourselves don't have the ability to test each model/color the safest thing is to stick to the materials/colors specified in published tests. 3. having said that, the sad reality is that other well known companies (ie: Orbit Baby) have in the past made claims of prohibiting the use of FR chemicals in their car seats and yet these car seats have actually tested positive for bad FR chemicals - so the industry has lost a lot of credibility. Ultimately, the safest option is to stick to the specific colors/models specifies in this post since those are the ones that we know have tested negative for FR chemicals. Clearly a new study of FR chemicals in carseats would be useful, since in the year since this was published, various new models and new companies have popped up in the marketplace. Not sure how much of a hurry you are in but UPPA baby has a 2017 model that should be in stores soon (once again it will be one specific color/material) that they claim will be 100% free of FR chemicals.... if you can wait a month or so it might be worth your wild.... If you sign up for our blog updates I am tracking that car seat to market and will be informing my readers as soon as it is available! Thank you for this information! Super helpful as I hunt for a safe infant carseat...Like Emily, I am looking to buy a Britax but concerned that the color option is important in the safety ratings and can't find onyx in stock anywhere. 1. Different colors and materials from the same company have indeed tested differently in the past ..... since we ourselves don't have the ability to test each model/color the safest thing is to stick to the materials/colors specified in published tests. 3. 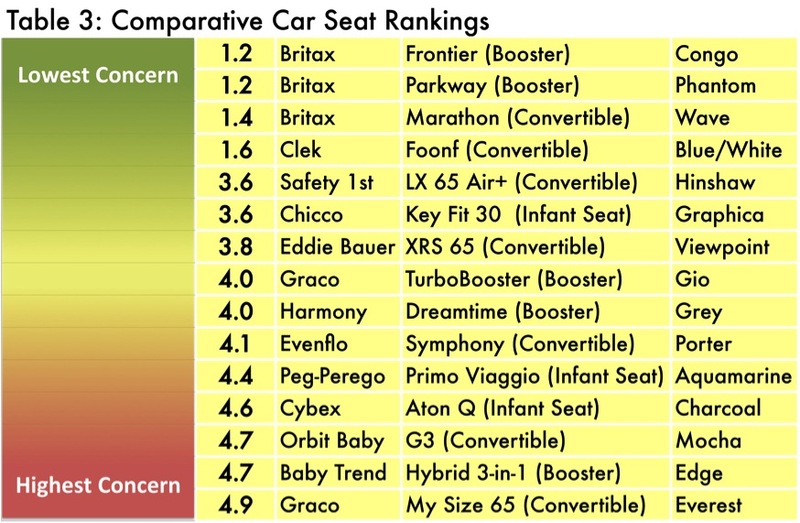 BUT, the sad reality is that other well known companies (ie: Orbit Baby) have in the past made claims of prohibiting the use of FR chemicals in their car seats and yet these car seats have actually tested positive for bad FR chemicals - so the industry has lost a lot of credibility. Ultimately, the safest option is indeed, to stick to the specific colors/models specifies in this post since those are the ones that we know have tested negative for FR chemicals. Crypton® Super Fabrics are GREENGUARD Select Certified and provide permanent protection against stains, moisture and odor-causing bacteria; and are free of brominated and chlorinated flame retardants. Not included with drift." Any information on this product? Thanks in advance! Let me know if you have any other questions... As soon as the Uppa Baby becomes available I will be posting on the blog , on Instagram (@nontoxicmunchkin) and on Facebook in case you would like to follow us! Crypton® Super Fabrics are GREENGUARD Select Certified and provide permanent protection against stains, moisture and odor-causing bacteria; and are free of brominated and chlorinated flame retardants. Not included with drift. Any information on this product would be greatly appreciated! I'm happy I discovered this site, I couldn't discover any learning on this issue earlier to.Also work a webpage and in the event that you are ever inspired by doing some guest composing for me if conceivable don't hesitate to tell me, im dependably search for individuals to look at my best convertible car seat.